For the last five years or so, while businesses have been alert about making themselves more interactive and engaging for the customer, automation has come as a brilliant tool. Most of the complex campaigns that were avoided by small businesses are now efficiently handled due to automation. One of the best developments in the realm has been campaign management solutions. Most large companies are connecting with their customers in personalized manners because of it. 1. With an automated solution, you are at liberty to personalize your customer connection. Instead of classifying your customers into different clusters manually, software will naturally work on the customer data and separate them according to the different sections you have set up. The classification can be custom made according to the features required by business for a specific campaign or event and the software will pick only those customers who meet the criteria mentioned selected. You are sending messages only to your relevant customers and not wasting time and energy on unnecessary emails and messages. 2. 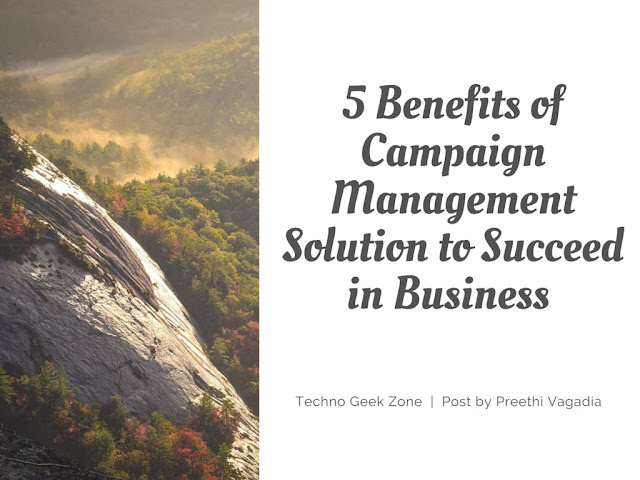 Using a campaign management solution, businesses are able to save a lot of time. The designing elements allow you to create multiple attractive campaigns ahead of schedule. You can preset the date and time and the messages are going to be released on a scheduled basis. This technology may have been around for some time, but with cloud, mobility, and scheduled posts for social media, the scope has become far bigger for marketers. 3. With automation, you no longer fear being inconsistent. Let’s say, you have diligently posted your content on the social media sites manually. However, the following week, you fail to maintain posting your content there. You are actually portraying an insincere image to your audience that way. With automation software, you do not have to manually bother uploading content regularly. Software will do it at the set schedules. It helps you present an image of being an engaged and active business. In the present world of online connectivity, remaining consistent is one essential element for your prospects to feel you are serious about their interests and concerns. 4. The manual task of designing posts and campaigns is both, laborious and error prone. With marketing automation, you actually receive detailed reports without errors or gaps. With an automated solution, you keep track of each email campaign, every social media post, or any other activity. You can use these feedbacks for further events or campaigns. A good solution will give you detailed statistical reports, which are excellent for analyzing future events. 5. Budget is one major factor for every business. With an automated system of campaign management, you can save a lot of money. As you need fewer employees, fewer online resources, and are also well organized, you save a lot by streamlining your processes. That makes scope for easy-to-follow rules and a greater marketing potential. Automated campaign management platforms make it easy for businesses, small and big, to create consistent presence across different channels. Every prospect is engaged with multiple devices simultaneously and surfing different channels. With automation, you are able to catch your prospect at every channel and device, simultaneously, and create a dominating brand presence for your organization.